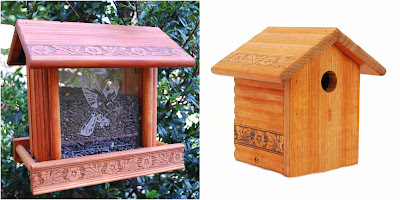 Here's a giveaway with two winners of some great looking bird feeders / houses. The giveaway is open to continental US residents only and ends on 6/29. Good luck. 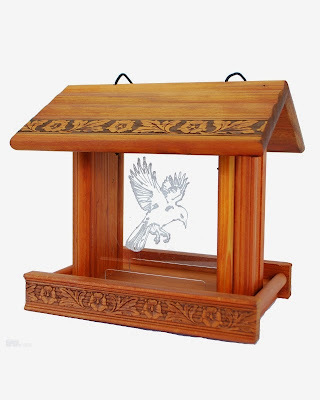 Holiday Contest and Sweeps recently had the pleasure to review the Mountain View Redwood Etched Glass Bird Feeder and Bird House from QMT Windchimes and was amazed at the craftsmanship that went into it's design. Mountain View Feeders offer the natural beauty of Redwood in innovative designs, producing pieces that are natural yet finished, elegant yet functional. With the help of a amazing group of fellow blogs there will be two winners who will each win a Etched Bird Feeder and Redwood Birdhouse. The winners must reside in the Continental United States and be 18+ years of age to win. The Redwood, which is naturally resistant to decay, is contoured and embossed with a unique pattern to enhance your garden. The Mountain View feeders are also designed for easy use--to check or clean out a feeder, simply lift the roof! When you are finished, put it back and apply pressure to snap it back into place. 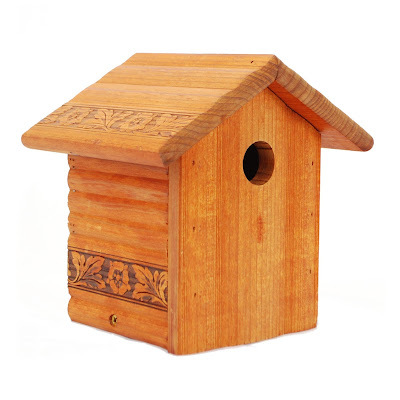 Mountain View™ Feeders are unique in that they offer the natural beauty of redwood set in completely original designs, producing pieces that are natural yet finished, elegant yet functional. The redwood, which is naturally resistant to decay, is contoured and embossed with a unique pattern to enhance your garden. I am pleased to say that QMT Windchimes has provided me with two of these beautiful feeders to provide as prizes in a giveaway for two lucky winners. Not only is the detail in the Redwood breathtaking but the etched glass will also leave you amazed from intricate embossed designs. The winners will be amazed at the different species of birds that this feeder will attract. Within minutes of filling mine with wild bird seed and hanging it from our tree, the feeder became the center point of attraction for Sparrows, Blue Jays, Cardinals and Robins. 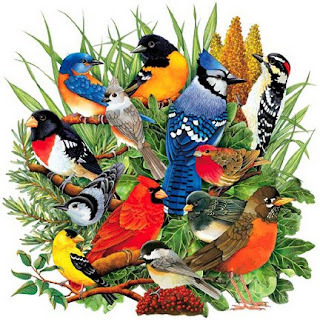 There is nothing that brings Spring more alive than seeing these beautiful birds in your yard. Click Here to visit the QMT Windchime Site for the leader in Chimes. of the Mountain View Bird Feeder directly to the winners.